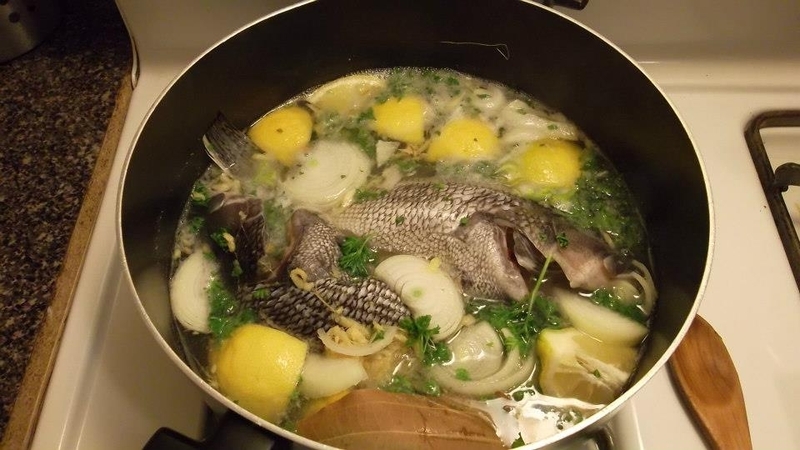 Fish simmering with lemon, ginger, bay leaf, parsley and other spices. Gumprich’s cookbook lives up to the promise of its title: it is both “complete” and “practical,” offering general introductions to dishes like fish entrees; which make cooking seem like both an art and a science. Her explanations suggest that a housewife needed skill in every aspect of food preparation, from the careful selection of the fish to its boiling in a pot. Particularly interesting is her direction to housewives to only buy living fish and then, before cooking, hit the fish with the back of a knife to kill it. If the fish is small enough, Gumprich directs the housewife to kill it by gripping it firmly in her hand and then hitting it a few times against the table. 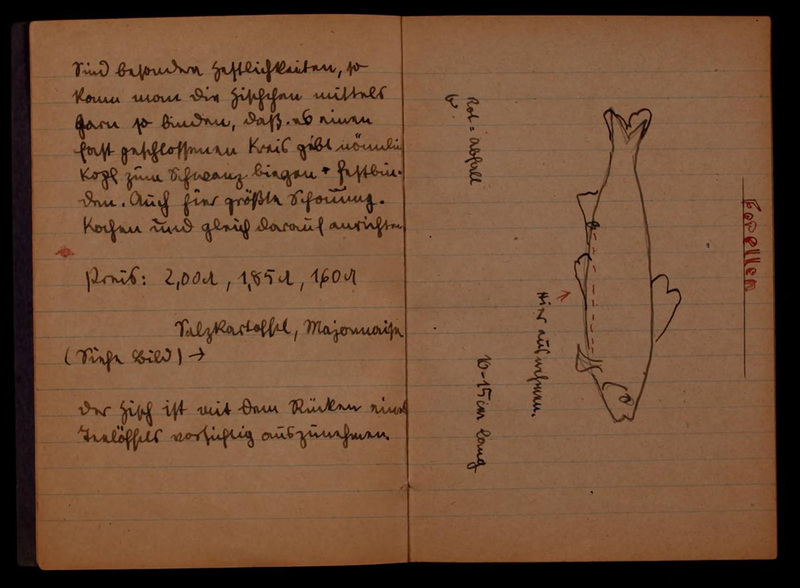 Gumprich also has extensive directions on how to determine whether fish is fresh and how to gut fish. Thankfully, I did not have to worry about carefully picking fresh, live fish or hitting it against a table before cooking it! I skipped these steps and picked up my fish from the supermarket; it was already dead, gutted, scaled and wrapped in cellophane packaging with expiration dates. This trout recipe was divided into two parts: the boiled fish and its accompanying mushroom sauce. The *trout are cleaned, gutted, washed and well salted; they can lie 1 ½ hours in the salt. Lay the trout in a pot, add to it pepper, ginger, lemon, bay leaf, parsley, onions, water and a bit of vinegar. The broth must cover the trout. Cover it and place it on the fire. Let it come quickly to a boil and for seven to eight minutes keep it covered but don’t keep it on strong heat. Uncover the trout and pull it back from the heat and let it cook another six minutes so slowly, that one can hardly tell. Pull it completely from the fire and let it sit there for a few minutes. Take the trout out of the broth and lay it to cool in a bowl. For best results, add oil, vinegar and pepper. Serve the trout with a warm Hollandaise sauce or also with mushroom sauce. Heat one to two large spoonfuls of full soup fat, stir in one large spoonful of flour until large bubbles form. Then dilute the flour with good bouillon and fish broth. Cut the mushrooms into small cubes and let them cook in the prepared sauce. Add to that a little pepper, ginger and the still-missing salt. Let the sauce cook well and stir with the addition of a few egg yolks. The sauce needs to be thick. Note: Dry mushrooms need to be cooked until they are well softened. Although the recipe appeared simple, I found the directions surprisingly complicated to execute, as they involved a lot of covering and uncovering of the pot, and raising and lowering the heat. Gumprich’s introduction on fish dishes further elaborated on cooking methods. 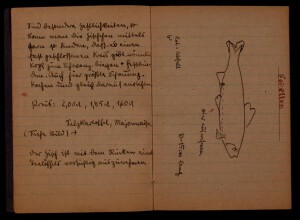 She asserts that, contrary to popular practices (of the 19th century), fish should be brought quickly to a boil, but should not be boiled on high. She recommended that the fish be left to boil until it feels hard and the eyes stick out. According to Gumprich, you can tell if the fish is finished cooking when you can pull out the tail and fins. Following the recipe and Gumprich’s additional directions, I brought the water rapidly to a boil, covering and uncovering the pot, removing and returning it to the heat (by lowering and raising the temperature knob). I waited until the fish looked hard and I could pull off the fins. The next step, the mushroom sauce, was actually quite easy to make, although few modern cooks are likely to have soup fat at hand. It was a unique experience to try a boiled fish dish, especially one cooked in vinegar, but I found the flavor bland aside from the tartness of the vinegar. Ultimately, I wouldn’t recommend this recipe because although it wasn’t bad, it wasn’t good either. My roommate tried the fish and looked disappointed. The mushroom sauce made the fish more palatable, but I wouldn’t try this recipe again unless I was trapped on an island with the same ingredients and pot. *Instead of trout, I used another type of fish recommended by the fishmonger as a close substitute.